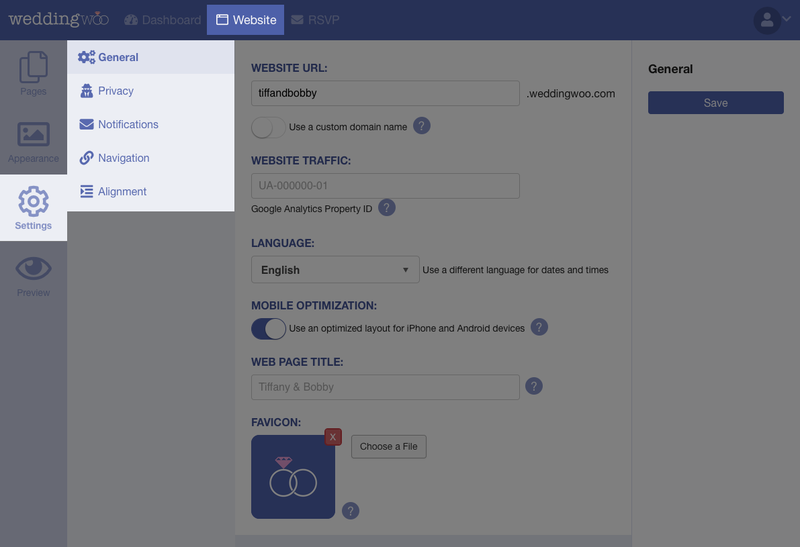 The settings for your WeddingWoo website is easily accessible in the "Website" section of your WeddingWoo Dashboard. Just click on "Settings" to access the various options to personalize your wedding website further. You can update your website URL, track web traffic, change language, choose mobile optimization, change the web page title and add a favicon. Password protection of your wedding website and the ability to enable search engine privacy. See the privacy options. Change the navigation titles, rearrange the order and choose the stickiness. See the navigation options. For the page and content headers, you can optionally change the alignment of the headers.